The Flash Season 5 Episode 10 Recap: "The Fast & The Furious"
“You’ll never be The Flash!” says Nora (Jessica Parker Kennedy) to Eobard Thawne (Tom Cavanagh). “Exactly! And that realization is what broke me. That’s the realization that led me to do the things that I did…the terrible, horrible, evil things I did,” replies Thawne whose locked up in Iron Heights in the future in season five episode 10 of The CW’s The Flash. The episode begins with Nora going forward to 2049 and confronting Thawne about killing Barry’s mother, Nora’s namesake. Nora’s furious with Thawne for lying to her and for the horrible murder of Barry’s mother. Thawne’s surprisingly truthful and admits why he became the Reverse Flash. He explains how he originally wanted to be The Flash but when he realized he never would, it changed him forever. Thawne tells Nora he thought she knew about what he did, that her mother would have told her. He apologizes for not telling her. Nora says she doesn’t trust him anymore, but Thawne points out he gave her what she wanted – a chance to travel through time and meet her father, to run with him, to be with The Flash. Thawne assures Nora he wants to help her but she believes he only does things to help himself. Thawne admits that for so long he did only think of himself, however he doesn’t want that to be his legacy. He pleads for her to let him help her. “I don’t want your help. Not anymore,” replies Nora, speeding back to present day. Caitlin (Danielle Panabaker) takes Cisco (Carlos Valdes) to the medical bay to remove the remaining shards from Cicada’s dagger out of his hands. Cisco admits to Caitlin he’s enjoyed the break from being Vibe and just being his old self again. Somewhere in Central City a woman steals a Lamborghini using meta-tech. Iris (Candice Patton) and Nora attend court to watch Barry (Grant Gustin) testify at Weather Witch’s trial. During opening statements, Barry gets an alert about the stolen car. He apologizes to Cecille (Danielle Nicolet) and leaves, promising to be back to testify in 30 minutes. Nora leaves with her dad and as they speed after the car, Barry tells Nora to get ready to grab the wheel and he’ll take care of the driver. When The Flash tries to phase through the car door he gets blasted back by unstable dark matter energy. Even worse, Barry quickly realizes he can’t stop phasing. Nora and Barry speed back to S.T.A.R. Labs where Cisco and Caitlin decide to put Barry in the power-dampening pipeline. Caitlin figures out what happened to Barry and tells him it will take a full day for the unstable dark matter to exit his system. Barry panics because he needs to be back in court to testify in 10 minutes. Nora offers to do it since Barry put through the paperwork making her an official CSI assistant. Back at the courthouse, Cecille has been sensing that Weather Witch/Joss Mardon (Reina Hardesty) is truly remorseful over what she did and decides to try to go for the lesser sentence. Nora takes the stand and Cecille asks only a few questions, basically setting Joss up to look less guilty to the jury. However, when Nora is cross-examined by Joss’ defense attorney, she tells the jury and the judge about Joss deciding to use the weather staff to hurt people for her own selfish plan. She believes Joss could have killed kids who were nearby during her attack. Joss stands up in court and admits she’s guilty and is willing to pay for what she did. Back at S.T.A.R. Labs, Cisco shows Caitlin the shards from Cicada’s dagger weren’t dampening his powers – they were removing them. The dagger has anti-dark matter properties. Cisco realizes they can make a serum to cure meta-humans for good. Caitlin doesn’t think they need a meta-human cure but Cisco does. Cisco tells Caitlin they created the metas against their will by crashing the dark matter satellite. The serum will give metas a chance at a normal life. Caitlin walks out, tossing out “maybe not everyone wants a normal life” as she leaves. The car thief uses her meta tech to hijack the police truck taking Joss back to jail. She frees Joss and offers her a ride. Team Flash does some digging and they discover the car thief is Raya Van Zandt, an Army soldier with the call sign Silver Ghost. Iris makes a few calls and reaches out to her dad, who’s out of town visiting Wally, to get the military file on Raya. Raya (Gabrielle Walsh) wants to rob ARGUS for its tech but needs lightning strikes to do it. That means she needs Joss to do her magic with her weather staff. Joss doesn’t want any part of it and asks to be taken back so she can start serving her time. Raya tells her to come find her when she changes her mind. Sherloque brings Barry some food and a bad novel to read to help pass the time. He asks Barry if he remembers writing the Speed Force Symbols when he came out of the Speed Force last year. Barry confirms he remembers doing it, but doesn’t know what they mean. Even Gideon couldn’t decipher them. Barry asks if it has anything to do with Cicada and Sherloque says it’s just a mystery he wants to solve. Right after he, leaves an alarm goes off and Caitlin says the Doppler’s indicating a hurricane in Central City. Nora realizes it’s not a hurricane, it’s Joss, and heads out to find her. Nora speeds to Joss’ location and Joss reveals she wants to turn herself in. She isn’t a career criminal like her dad and if XS tells everyone she turned herself in, maybe people won’t think she’s like her dad. Nora speeds Joss to CCPD but doesn’t tell them she’s turning herself in. Instead, she acts as though she caught her. Joss becomes upset and pleads with her to tell the truth as she’s taken away. Iris, one level up retrieving Raya’s file, witnesses what Nora did. At S.T.A.R. Labs, Cisco’s working on the shards and dark matter when Killer Frost blasts the shards, destroying them. Cisco asks her what she’s doing and she tells him he’s smart, he’ll figure it out. He reminds her a meta-cure could help people. Frost tells him that Caity and her are doing just fine and so was he until Cicada got into his head. Frost understands that Cisco is trying to create something to save them all. Cisco confesses to Frost he wants a wife to grow old with and have a kid. Frost assures him he doesn’t have to choose between having powers and having a family. “I’m not The Flash. I don’t want to be The Flash, I want to be me. A cure is the only way…or it was,” says Cisco as he walks out leaving Frost alone in the room. She realizes she may have been wrong. Iris talks to Nora and tells her everyone deserves a second chance. Barry gives second chances to people more than anyone she knows. Raya breaks Joss out of jail and gives her the weather staff she retrieved from the evidence room. Teaming up, they head out to rob ARGUS. Joss uses the weather wand to tie up ARGUS’s systems so the thieves are able to steal a new prototype car that’s jam-packed full of special extras. Team Flash tracks the weather staff and Nora and Caitlin go after the thieves. Frost creates an ice wall but the car can phase through it. Raya puts the car in invisible mode and aims it at Nora. Nora asks Cisco to patch her into the car’s com so she can talk to Joss. Nora tells Joss she was wrong and that she should have given her a second chance. She asks for her own second chance now. Joss subtly uses the weather staff to create ice on the road and the car crashes. Joss tells Raya to hold onto her and she uses the staff to help them escape. Nora thanks Frost for icing the road and Frost reveals her she didn’t. Barry’s let out of the pipeline the next day. He’s happy to be back with his family and suggest to Nora that Joss is her Snart. Caitlin gives Cisco his winter jacket, advising him to put it on because it’s cold where they’re going. Caitlin and Cisco breach to her father’s old lab and Caitlin explains her dad’s notes on metas could be useful for creating a meta cure. Cisco’s confused and Caitlin tells him she shouldn’t stand in the way of what he wants. However, she still thinks it’s dangerous. Caitlin says she’ll help but there needs to be ground rules. First and most important is that they’ll never force a cure on anyone. Cisco agrees. Nora visits Thawne in 2049 and tells him that although she doesn’t trust him, she wants to give him the chance to prove to her he can be good. In the episode’s final scene, Sherloque talks to Gideon and asks to see all the files on Nora West. Gideon tells Sherloque that all files on Nora West have been deleted by Nora West. More talk than action, season five episode 10 titled “The Flash & The Furious” comes across more like a set-up and filler episode than anything else. The main hero, Barry, is sidelined for almost the entire episode and brother it is NOT the same show without him. 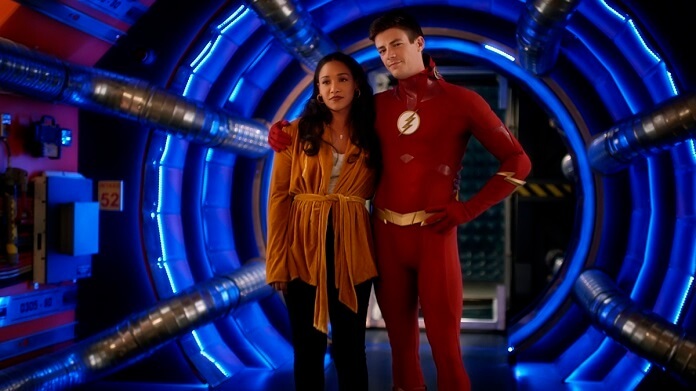 Sorry but Jessica Parker Kennedy as Nora is not up to the challenge of carrying an entire episode the way Grant Gustin does being front and center as the hero. This is perhaps one of the weakest episodes of this season. The stand-out performance goes once again to Tom Cavanagh for his masterful portrayal of future Eobard Thawne who comes across still incredibly devious, brilliant, and dangerous, but also regretful and defeated. The opening scene between Cavanagh and Kennedy as Thawne and Nora is the best in the episode. Cavanagh also deserves praise for his portrayal of Sherloque Wells working on unraveling the mystery of Nora and her secrets. Sherloque and Thawne are two completely different characters and Cavanagh brings both to life on the show with such brilliance it is truly amazing to watch. 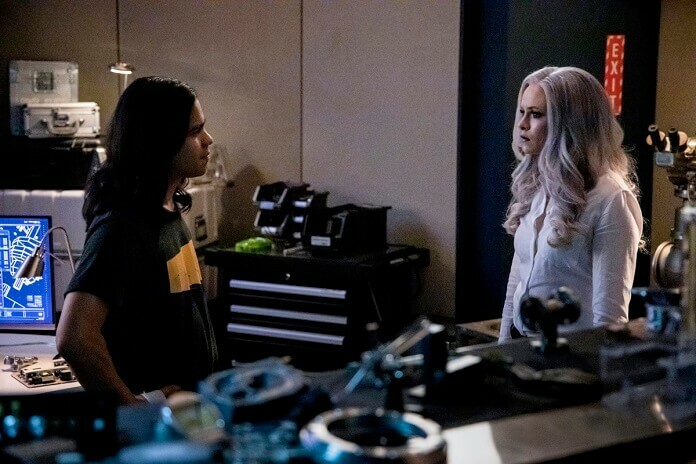 With Caitlin and Cisco working on a cure for meta-humans (I’m with Killer Frost on this – it’s a BAD IDEA!) and Nora about to trust Thawne, things are about to get complicated and most likely worse for Team Flash.